Director R Chandru and his Mylari team are in a celebration mode and not without reason. The Kannada film's music album has been selling like hotcakes across Karnataka. In fact on the first day of its market release itself, 22,000 CDs were sold. This is good news just not for the film but also for the audio industry that is battling piracy. "I'm surprised by the range of sales. Even in Siddalgatha, which is a Telugu belt, there is great demand for the music CDs. Normally we sell around 20 pieces in that region but over 200 Mylari CDs have been sold already and there is demand for more," says an elated Mohan of Anand Audio, which has the music rights. 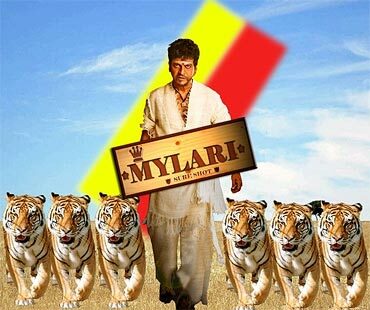 Mylari stars Shivarajkumar in the lead. Gurukiran is the music director. Jogi which boasted of the same actor-music director combination also saw record sales before the release of the film itself. In fact there was a gap of over 100 days between the audio and film release and roughly four lakh cassettes and CDs were sold. "We are overwhelmed by the response to Mylari's music. To celebrate the success and to officially launch the music, we are holding a gala ceremony in Chitradurga this month end," says Chandru. "Puneet has sung this song. Shivanna has done 38 signature steps in this song which is already a huge hit. Pradeep Antony is the choreographer," says Chandru. The demand for Shivarajkumar film CDs is generally said to be anywhere between 10-15,000 and the sale of Mylari's audio comes as a shot in the arm. There have been previous instances when pre-release sales have registered roaring business. For instance over a lakh music cassettes and CDs of films like Upendra and H20 were sold just in a day. The music of the film Friends had also done good pre-release sales. There was a gap of 45 days between the music launch and film release and yet three lakh copies were sold. Music of Taj Mahal, Milana, Cheluvina Chittara, Mungaru Male, Yajamana, Annaya, Gadibidi Ganda, Apthamitra, Janumada Jodi and most recently Maleyali Jotheyali, Pancharangi, Raam and Jackie had also registered good sales before the release of the film. If you go further down the memory lane, most of Rajkumar films garnered great response. The music of Devata Manushya, Kaviratna Kalidasa, Jeevana Chaitra and the combination of Bhakta Prahalada and Kaviratna Kalidasa were in great demand. "But today the demand for light, folk and devotional songs CDs is more," observes Velu of Lahari Audio. However he too cannot forget the phenomenal response Ravichandran's Premaloka received. At the pre-release itself 40,000 cassettes were sold while post release sales went up to 38 lakh. "After music director Hamsalekha came in, the scene changed. Lahari-Hamsalekha combination itself runs up to 220 films. Of these the music of 130 films went on to become super hits. Ranadheera, Anjada Gandu, Muthina Haara, Avalena Nanna Hendti and Ramachari were among the films shot between 1985-92 that had hit music and made good business. This was the golden period," says Velu. While most of Ravichandran's films audio generated good sales, in the present context the demand for his films music CDs is said to be around 15,000. The demand for cassettes and CDs of Puneet Rajkumar films is roughly about 25,000, while those for Darshan and Upendra films is around 15,000. Thus, in order to make the business more viable audio companies have started releasing only combination CDs and MP3s. "We club the latest films or popular hits and release them together as this is more profitable," concludes Mohan.